The "Berry Good Farm Market", the Reed neighborhood's year-'round source for plants, produce, and duck food, changed hands over the Labor Day weekend. The business is on S.E. 28th just east of the Reed College campus and Crystal Springs Creek, on the west side of the street. Former owners Marci and Gary Daniels, who had been there for fifteen years, sold their roadside stand at 5523 S.E. 28th Avenue to Cliff Parsons of Parsons Farms. The new owner family also has sites in Canby, Dundee, and Dayton, and has participated in many farmers markets over the years. They plan to be open daily from 11 a.m.-6 p.m. Manager Lori Christensen assures THE BEE that all produce will be local. "Some produce, purchased in bulk, may receive a discount," she reveals. "We plan to focus on seasonal items. Currently we have lots of berries. For fall, we'll carry pumpkins, hay bales, corn stalks, and other farm items used for decoration. At Christmas, we'll carry Holiday Trees and wreaths. We'll also have duck and squirrel food, local honey, and other farm staples. Phone us at 503/266-7875 for more information." 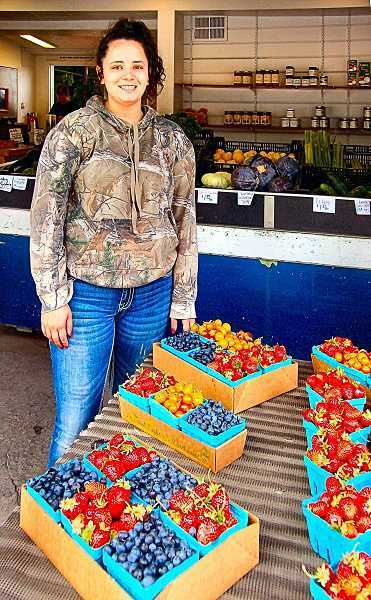 In addition to "Berry Good" fresh produce and cut flowers, the new owner has rented space to a new adjacent vendor, a mobile red food cart called "Bol & Crust" – which offers scratch-made hand pies and "healthy rice bowls", to eat on-site or to go.